Put the stock in a saucepan on the stove and keep at a gentle simmer. Heat oil in a large, heavy-based saucepan. 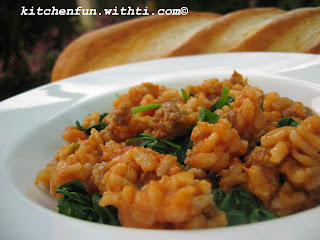 Add sausage meat and cook over medium heat for 3-4 minutes, squashing it with a spoon to break it up. Add onions and garlic, and cook gently for 10 minutes or until onion is soft and golden. Add diced tomatoes, and simmer over medium heat for 5-10 minutes. Stir in the rice, making sure it is heated through. Begin to add the hot stock, a large ladleful at a time, stirring gently until each ladleful is almost absorbed into the rice. The risotto should be kept at a bare simmer throughout the cooking, so do not let the rice dry out - add more hot stock as necessary. 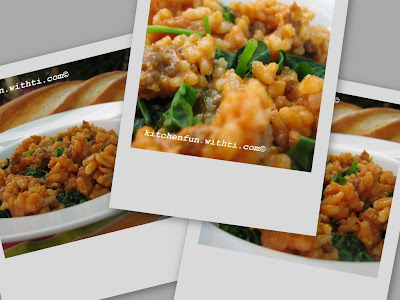 Continue until the rice is tender and creamy, but the grains still firm. This should take between 15 and 20 minutes, depending on the type of rice used ? look at the manufacturer's instructions. Season to taste with salt and pepper . Cover and rest for a couple of minutes to allow the risotto to relax . You may like to add a little more hot stock just before you serve to loosen it, but don't let the risotto hang around too long or the rice will turn mushy. Serve in warm bowls, sprinkled with parmesan and garnished with parsley, if desired. Ti! kayaknya gampang ya bikin risotto!.... cuma kok kalau weekend malassss bener masak! waktu weekend bener2 buat istirahat! Nah maksudnya nich... kalau bikin risotto lagi...... kirim ya heheheh....! !